This registry links several different stores because we couldn't decide on just one! So we have listed items from Target, Amazon, Babies R Us, Carter’s, Mission Critical and Walmart! 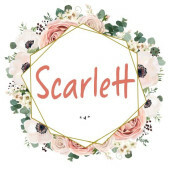 We are very excited for little Scarlett to make her grand appearance and every little item on this list will help us in providing what she needs. Richard and I appreciate your help on this awesome journey of becoming parents! We love you all!